Ready your sweet tooth! From swirled chocolate bark to rainbow grilled cheese sandwiches to Frappuccinos, there's no shortage of adorable unicorn foods to eat and drink. 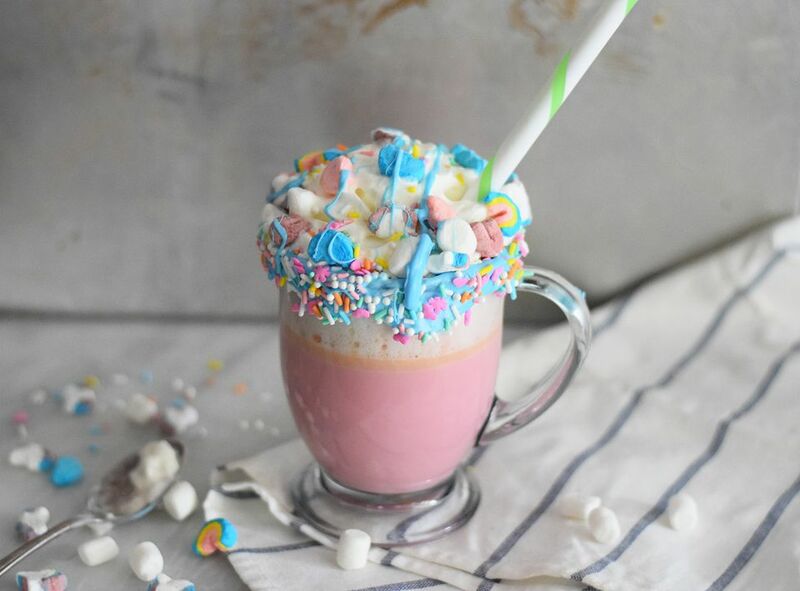 This unicorn hot chocolate is full of sweet, warm goodness and colorful accents that make regular hot cocoa look a little, well, boring. It may sound fancy and complicated, but there's really not much to it. Unicorn hot chocolate is essentially melted white chocolate mixed together with a little food coloring and a lot of fun—it's super easy to whip together. You can use whatever sprinkles, marshmallows, whipped cream, and frosting that you want. Set up a cute hot chocolate bar for a unicorn-themed party or sleepover in those chilly winter months. You can also change up the color of the white hot chocolate itself, make it blue, pink, or purple. Place the whole milk, sugar, and vanilla extract in a small saucepan. Cook on low heat until it is just simmering, not boiling. Add in the chopped white chocolate to the warm milk mixture, whisking frequently, until the white chocolate has melted and the mixture is smooth. The amount of food coloring you need depends on what brand and type you use. If you are using red food coloring, add just one or two drops at a time and whisk until it reaches a nice light pink color. If you are using pink food coloring, you may need to add a few more drops to get the color you want. Dip the rim of your mugs in the blue frosting and then dip it into your pastel sprinkles. Pour the hot chocolate into the mugs and top with whipped cream, marshmallows, and sprinkles. Serve immediately with a cute straw! Using white chocolate that is meant for melting will create the smoothest hot chocolate. You can usually find these melts at craft stores. You can also use white chocolate chips or white chocolate baking bars. Make sure you cook the hot chocolate on low heat and take your time letting the chocolate melt. If you cook it too fast the white chocolate can burn and then it won't fully incorporate into the milk. You can use gel food coloring or liquid food coloring. Just make sure to add a tiny bit at a time so you don't have to start over. Try to choose sprinkles, frosting, and marshmallows that are on the same color scheme for the most visually beautiful mug of hot chocolate. A clear mug also showcases the beautiful colors.